Today's New York Times Book Review section is crammed with "thriller" reviews. I'm not convinced about the label -- some of the reviews in here are standard-genre mysteries, to my way of thinking -- but I surely enjoyed spending my Sunday morning browsing the opinions expressed, including a review by Lee Child (!). Fun idea for a summer surprise issue. When I'm considering writing about a mystery, I almost never look at any reviews before I've written my own. And afterward, of course, I'm usually on my way to the next book, so there isn't time to compare. 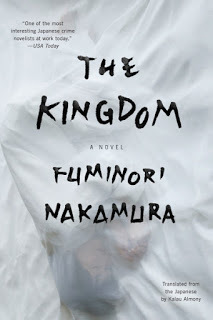 But I noticed this review by author Jan Stuart of Fuminori Nakamura's newest Japanese noir, The Kingdom, which I'd already reviewed back in early June, so I took time to think about the difference in review approaches. I wasn't happy about reading Nakamura's work at first, and if it hadn't been brought to the American market by one of my favorite publishers, Soho Press, I probably would not have persevered. But with time, and having read several by now, I've decided that for me, Nakamura's fiction confronts global violence in necessary ways. The Gun is his most obvious effort at this, but The Kingdom also fingers personal violence, the kind that's manipulative and mean and even the verbal kind that we associate with bullies and sometimes politics. Because I write "historically hinged" fiction myself, I read a lot of scholarly history -- and then enjoy diverting into really good historical fiction, where the action comes alive and the crises are emotional. In the same way, in an era when crime haunts all news channels and Presidential campaigns, it's a treat to dip into the emotionally potent storytelling of Nakamura's books. Count me in for the next one, too. With a publisher name like Oceanview, it's easy to suspect the new detective title from D.P. Lyle might be set in Florida -- but no, even better, it's on Alabama's Gulf Coast and it's a lively investigation laced with both humor and danger. And expertise! D.P. Lyle isn't just an award-winning author of crime fiction. He's also a forensics expert consulting for the top TV crime shows and is the expert I'd most like to know was coming to a crime-novel dinner party, because he's quick to correct the scenes and the reasoning. In other words, his firearms and 'tec services make sense. Thank goodness! But who knew (from that background) that he could also be so entertaining? Well, the truth is, although I take note of his forensic pointers regularly, this is the first time I've read one of his crime novels ... and I'm going to have to gather up some of the others soon. There are already three series (see Lyle's website) and DEEP SIX launches the fourth. Jake Longly is a former pro baseball player, and the last thing he wants to do is work in the family business, private investigations, for his dad Ray. But he's not above taking an occasional surveillance job for a bit of cash flow. Unfortunately, checking on a possible womanizer for his father's caseload puts Jake into the neighborhood of his suspicious and assaultive ex, who's good with a baseball bat. Escape from the situation takes Jake and his classic car directly into the circle of a gorgeous beach bunny, Nicole, who turns out to also be a very smart script writer -- and eager to assist in "surveilling" while also, umm, taking part in adult activities with Jake. Add a Ukrainian mobster, a high-money land grab, and some deft legal and risk-taking twists, and it looks like Jake Longly could get hooked on the adventurous side of his dad's PI business, after all. That is, if he and Nicole can survive! 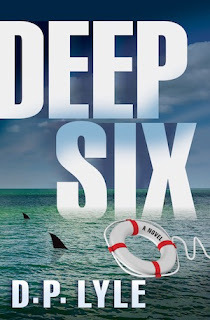 With a quick pace, great scenes, and "murder and mayhem" right and left, DEEP SIX promises a lively new series ahead for D.P. Lyle and Oceanview. Add it to the summer reading stack, for sure! 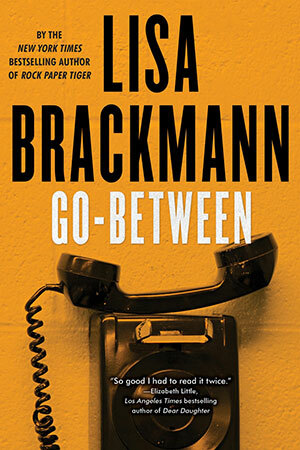 I'm a total fan of Lisa Brackmann's China-set crime series that began with Rock Paper Tiger, followed by Hour of the Rat and Dragon Day. Ellie McEnroe, an Iraq war vet with a bad leg, flashbacks, and a serious passion for life in modern China, gets pretty mixed up in how she handles life, especially the political pressures and risks that Americans can trigger in that place. Her mistakes are understandable, and her frustrations and loyalties appeal to me. 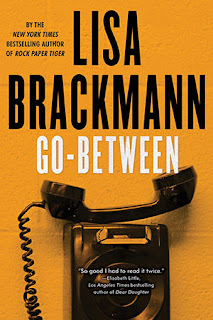 The thriller route that Brackmann also opened with Michelle Mason in Getaway rubbed me wrong -- I felt as though Michelle's poor choices didn't make sense for how smart she is. So I'm glad to say that with the second book in this series, GO-BETWEEN, Michelle seems to have her smarts back into place. Unfortunately, her situation -- partnered with a serious cannabis merchant in northern California -- is designed for failure, and when her boyfriend Danny gets arrested and tossed into the for-profit prison system, it's clear that the sociopathic ex-CIA agent who got them into this mess to start with is back in their lives. For the worse, actually. You can't worry about that now, she told herself. First things first. See Danny. Tell him what was going on. Find out what he thought she should do. She'd worked through all the options, and she thought she knew what the best one was, but maybe he had a better idea. An angle she hadn't thought of. Because the best option she'd thought of for this situation wasn't very good at all. Ironically, what Gary -- the ex-CIA manipulator -- wants Michelle and Danny to do for him is connected to the war on drugs, as well as big-money politics and the role of nonprofits with wealth behind them. Michelle's assessment turns out to be on target: There are no good options this time. Torrey House Press has a strong commitment to Western Lit -- and just brought out the third "National Park Mystery" from Scott Graham. Graham's previous two titles, Canyon Sacrifice and Mountain Rampage, provided a refreshing counterpoint to the noted Nevada Barr mysteries, also set in national parks. Graham's "amateur sleuth" Chuck Bender is an archaeology specialist, contracting with the nation's prestigious Western preserves to name and document the mostly early First Nations artifacts that turn up in the caves and crevices of Western terrain. Chuck Bender's intrigue as a character includes his passion for his new Latina wife and stepdaughters. His roles as husband and father are maturing, book by book -- and so is his willingness to include Janelle and the girls directly in the action. Janelle's determined to engage this wilderness that Chuck loves and shares with her, to the extent of even taking Wilderness First Responder and Backcountry Medicine courses. That brings her into the height of the action, too, which quickly ramps up in book three, YELLOWSTONE STANDOFF, to include attacks by both animals and humans. Charging into the crazy situation of a national park that's home to wolves and grizzlies while allowing human guests to explore the landscape, Graham's character's benefit from this author's expertise in the outdoors. The scary effects of climate change on Yellowstone (described in even more detail in "Yellowstone 2.0" by Jake Abrahamson in the July/August 2016 issue of Sierra and with historic richness in the recent Gloomy Terrors and Hidden Fires by Ronald Anglin and Larry Morris) turn out to be what's summoned Chuck Bender to the part: A vanishing glacier revealed ancient artifacts, and Chuck and his teammates need to document the find. Chuck scrunched his face in bewilderment. "So you think this grizzly, Notch, might be a manhunter, and you've situated your research camp in the most likely place for the bear to turn up?" "The best outcome of all would be a safe sighting of Notch through the presence of lots of folks in a part of the park generally uninhabited by humans but well trafficked by grizzly bears, then tracking down the bear from there." "Okay. Fine. I get it," Chuck said. "But I still can't figure out why you gave the all-clear for me to bring my wife and kids." Good point. Of course, this is crime fiction, so it's pretty likely there's a criminal human also involved in the terrain. When Chuck finally figures out how the pieces fit together, his family is definitely at risk. I enjoy Graham's deep familiarity with the Western terrain, as well as with archaeology and some new methods of exploring land, animals, and artifacts. 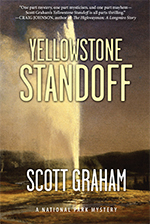 YELLOWSTONE STANDOFF is a lively page-turner and it's great to see Graham's characters maturing with the series. I found the tech side of things to be a bit stretched in terms of what science can actually do with wild animals, so if you're a science type like I am, brace for a few skeptical moments. But the plot is swift and smart, the story's memorable, and the series is well worth collecting and enjoying. 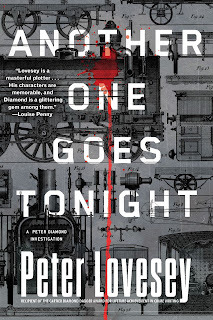 What a delight the new Peter Lovesey mystery is! Detective Peter Diamond steps away from the personal issues that have plagued him in recent titles in this irresistible British series, in order to investigate an accident involving a police car, a police fatality, and a critically injured civilian. Under pressure to quickly clear the officers, Diamond is the one who actually finds a motorized tricycle that the duty car had struck -- and then the injured man. Mouth-to-mouth resuscitation of an old person, very likely dead, isn't for the squeamish. The urgency of the situation overrode the reluctance. ... He stooped lower for more mouth-to-mouth. The first instinctive reluctance had gone. He cared, he really cared. Hot lips against cold. Two lungfuls of air. ... He and his mate here were not letting go. There had to be life. Come on, old friend, he urged as he worked his aching shoulders, you and I can do this. Of course, Diamond's heroics make the situation far worse for the police force, and his superior's pressure escalates. Who is this Ivor Pellegrini that Diamond has found nearly dead, and why does the first cursory investigation of his life -- an old man with a group of friends who get together to talk trains and other topics of the aged -- have such a creepy feel to it? Lovesey lays out a classic British mystery here, but thanks to the quirks with which he's now endowed both Diamond and the crime victim (and suspects! ), ANOTHER ONE GOES TONIGHT is full of lively twists in what we know, what Diamond guesses, and how to prove it. 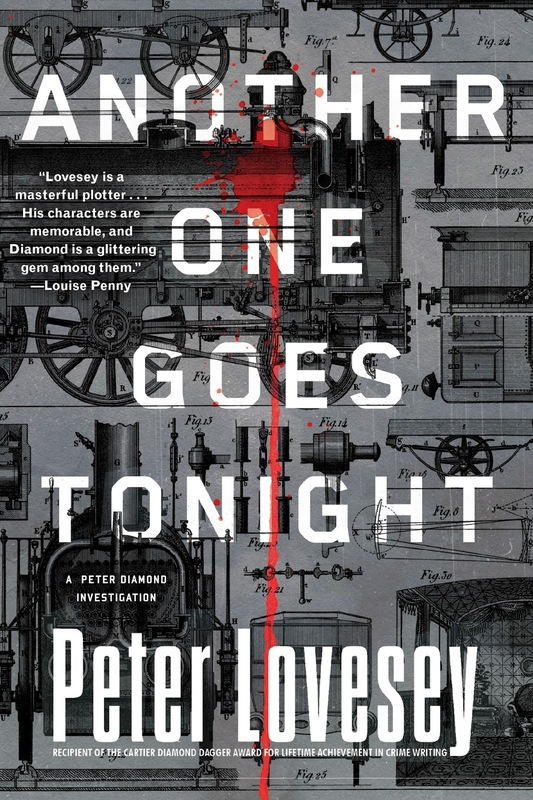 Put this one on the summer reading list for pure enjoyment of the latest work from Lovesey, who has now created more than 30 mystery novels and gathered most of the top awards in the field. If this is your first sample of Lovesey's line, fear not -- there's nothing in the plot that requires you to have read the earlier books. Be sure to make some guesses of your own about the neighbor's report of the naked man swimming in a pool nearby. Any intriguing distraction provided by this master of the genre has a purpose, a reason, and another quirky twist in store! Many thanks to Soho Crime for continuing to bring this series across the Atlantic. A few months ago, the University of Minnesota Press completed its publication of all three books in Norwegian author Vidal Sunstøl's "Minnesota Trilogy" of Norway/Minnesota crime fiction, richly underlaid with mysticism and the deep ringing notes of an author who writes far more deeply than "genre" fiction labels suggest. I treasured all three -- but as a Vermont resident, it was the second title, Only the Dead, that shook me and lingers in my mind as if I'd experienced it. Now another link to the American Midwest rises with the newly published American version of Carl-Johan Vallgren's THE BOY IN THE SHADOWS: Brought across the Atlantic by Quercus (owned by Hodder and Stoughton), the novel was translated from Swedish by Madison, Wisconsin, resident Rachel Willson-Broyles, who took advantage of the Midwest's historic connection with the Scandinavians to become an expert in bringing one language into taut, exhilarating coupling with another. Every page of THE BOY IN THE SHADOWS feels like it's written in a native American language (with a touch of British), allowing Vallgren's disturbing currents of menace and despair to flow freely. 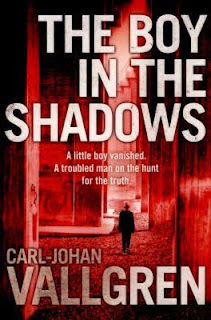 The book is Vallgren's crime fiction debut, although he has a long track record in other Swedish fiction and is an award-winning and much-heralded author (and musician) in his native land. What malice, what evil, in someone's past erupts in violent murder? And are there currents that swirl definitively both forward and back in time from the ultimate evils? Danny Katz, a recovering heroin addict with a significant Jewish identity, is about to find out, when an old military friend's wife asks him for help finding her missing husband. Could Joel, the eventual heir to the Klingberg family wealth, have cracked under pressure of his own long-ago disaster? What are the powerful Swedish family's roots in both Scandinavia and the Caribbean? Danny's past makes him an easy victim, and it's soon clear he's being set up in several ways. But he's determined to keep a commitment to locating Joel -- until the level of danger sweeps away almost all of what he values. The arrival of another individual determined to unravel the knot of the past, Eva Westin, provides a scrap of hope that Danny may elude the net cast for him. But what will he have to surrender in return? Brace for a long series of unexpected but highly satisfying plot twists in this one -- if you are collecting Scandinavian crime fiction, it's a must for your shelf, but it will also intrigue those who appreciate what a shared military past can impose on a friendship ... as well as readers who appreciate how the power of the industrial and scientific complex can become a dark and terrifying force. No website for the author at present, and the Wikipedia page is sadly lacking, but Quercus offers a bit on Vallgren here. Another translation from Vallgren, The Tunnel, is underway.